Where, oh where, have I been? Well to tell the truth I’ve been hiding under my covers waiting for spring. Okay maybe that’s not the truth, but the days are getting colder and the blankets are oh so inviting. Especially since a certain little baby isn’t sleeping all that great right now. Cordelia’s currently working on her 7th tooth. Or is it 8th? I’m not sure – I’ll wait until she bites me next and I’ll count the indents to be sure. 8 Months already. Where has the time gone? We now have a stander. She pulls herself up onto everything and cruises around the room, but that isn’t enough. She also lets go and stands. Yep no hands. Besides standing she also climbs. Its her favourite game. I set her down and she crawls as fast as possible for the stairs, while I sit at the computer. She climbs and I pretend not to see her until she’s at the third step. Then I say “I’m watching you.” She looks over her shoulder, grins, and climbs faster. By that point I need to go over because our stairs curve. She has a tough time with the curve and’s more likely to fall. But it’s been weeks since she actually fell. Well that’s if you don’t count today when she laughed so hard she couldn’t support herself and slid down the stairs on her belly. It was pretty funny to watch. No babies were harmed in the making of this blog post. Cordelia’s also eating everything in site. In fact she eats more than her big sisters in a day (and that’s both of them – combined). I can just see her grabbing her tummy and saying “In Greece, we eat a lot” much as a waiter did on our honeymoon when Ryan didn’t finish his meal. She’s talking. Her favourite word is “Dada” followed by “Yesh” (yes). She also says all of our names, banana, avocado, ouch, I know there’re others – oh yes “Hi” and “bye” and even a couple of times a couple two-word combos – “Hi dada” – “more dada” “Ouch Eya (Ella)” lol the important ones. Though right now there are only about 6 words that everyone can recognize other than just us. Agatha’s decided she doesn’t like swim lessons as much as dance and ridding lessons. So come winter there’ll be one fewer class. Ella’s cutting theatre from her class line-up but that’s mostly due to me wanting to cut back. She’d happily continue all her classes, and more. But she does love the marathon play-dates where we go to a friend’s house once a week or so and play for 4-6 hours straight. lol Even then, she pleads not to leave so soon. Agatha’s firmly in need of mommy right now. I have to put her to bed, and help her with everything. Time at the computer only happens after she’s in bed, and time in the kitchen means time with her. Though things are improving. Yesterday she allowed me to go out for a couple of hours to a meeting. And Ryan’s been permitted to get her a glass of milk once or twice. She also has a tough time when we leave the house too many times in a week. That’s the number one reason we’re cutting back on classes. We had a play-date one day and she was hitting, and refused to share. Those aren’t normal behaviours for her so I knew something was bothering her. As we’ve cut back on things, she’s become happier again. Ella thrives on being out and about doing things. Especially if it’s something different everyday of the week. But we have to balance out her needs/desires with everyone else’s. So we try for one play-date a week (two if one’s home) and between her and Agatha we leave home 3 times a week for classes. All in all it’s not too bad. We’ve hit a turning point with Ella, she’s so close to figuring out the whole reading thing. Everyday she’s asking us to spell new words for her. She’s playing with words, sounds, and letters all the time. There are a few games we play on the computer that allow her to type messages, so she does. Her favourite word to spell right now is ‘Boo’ in favour of a certain holiday coming up. We’ve brought a couple early readers home from the library that she’s read cover to cover on her own with only minimal help. She was so proud of herself. She read the books to everyone who’d stop and listen. Her stuffies had no choice but to stay put and listen to the story over and over again every night before bed. She’s also finally hit a turning point and has been using the potty for the past 2 days. (But that’s a story for another post in a day or two). Ryan’s working. All the time. We’re really looking forward to his vacation in November. We’ll be off to the Happiest Place on Earth. I can hardly wait. I’m tired and grumpy. I’ve been adjusting my thyroid meds hoping to find a balance, but things are pretty precarious and even the slightest bit off on either one leaves me foggy and unable to cope with even the smallest things. Luckily I seem to have found a bit of balance right now. Which is part of why I’m able to write tonight. Stringing words and sentences together when I can barely think is almost impossible. It’s still pretty difficult. The screen is a sea of red and blue right now. The computer’s either changed all my words, or can’t figure out what I mean. My words are ending up jumbled, letters swapping places. But that seems to happen a lot when my head gets foggy. It takes more effort to write so I just don’t do it. The good news is that at 8 mos postpartum we’re closer to the point of finding actual balance that lasts more than a week or two. In other news Ryan is doing a dairy challenge, that means less cheese in the house for the rest of us. Otherwise I add cheese to everything. And he’s apt to eat it by the brick (yuck). We’ve also confirmed that corn really is a big deal for Cordelia. So I’m gluten-free, corn-free and Ryan’s gluten-free, dairy-free. So food is quite the adventure around here. For our trip we’ll stick to just gluten-free; we have to sacrifice so many yummy treats already, we don’t want to lose anymore while we’re in the land of Mickey Ice Cream Bars and Dole Whips. I’m not concerned about when our children learn to read. I have no doubt they will – after all they’re fascinated with books. And they really want to find their shows and play their games on their own. In order to do that, they need to read. We’ve watched Ella learn so many things since she was born. I have to admit, we’ve done a lot of encouraging. When she was learning to walk, we held her hands and walked around with her for hours. When she was learning to talk we repeated words over, and over, and over again. We listened patiently while it took her a minute or longer to finally get the word she wanted. We didn’t rush her. What she had to say was important to us. Now, as she’s growing again, she stutters. We wait for her to finish saying what she has to say. It would be faster to finish for her. We know what she’s trying to say. But we trust her to get it, and that is more important that moving on. Reading is no different than any other skill she’s already mastered. She’s started and we reinforce what she’s learned. She points out a letter and tells us the sound, we repeat it, then add a word that starts with the letter/sound. When she asks us to read to her, we read. When she asks us to listen to her read, we listen. It doesn’t matter that what she’s saying isn’t what’s actually written. For now she’s learning the ‘act’ of reading and mastery will come later. Most recently she’s taken to looking at pictures, and trying to figure out the words. She’s pretty good and has completely ‘read’ several books on her own. Yep the picture gave it away, but she still got the correct words. She’s also taken to writing. She writes her name, she writes her letters, she tries other names. Agatha is such fun name for her to write. So she tries. Over and over, and over again. She also types. She sends messages frequently. Usually to Ryan and I. She’s taken to learning new words just by writing them and typing them repeatedly. It’s possible she might not master reading for a couple years, but it’s clear she’s heading in that direction. We haven’t sat down with her and forced her to learn her letters or sounds. She picked it up on her own, based on her interest. Allowing her to continue to choose her own path paves the way for a love of learning that, we hope, will stay with her for life. Combine water and sugar in a heavy bottomed saucepan, stirring until dissolved. Add cinnamon, cloves, all spice. Bring to a boil; lower heat to medium high (just shy of boiling). Add the remaining ingredients, stirring frequently until heated through and mixture thickens slightly, about six minutes. Do not allow to boil at this point. 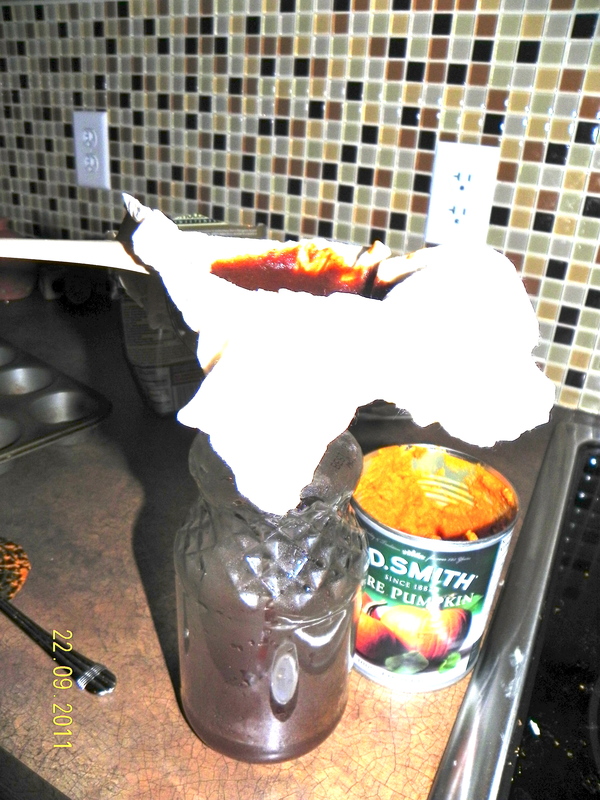 Strain syrup through cheesecloth into a glass container. For best results allow to sit overnight before use. Flavours will intensify. To make a latte similar to a certain siren cafe, simply add approximately 1 1/2 tablespoons of syrup for each shot of espresso. Steam desired amount of milk and pour over espresso and syrup. 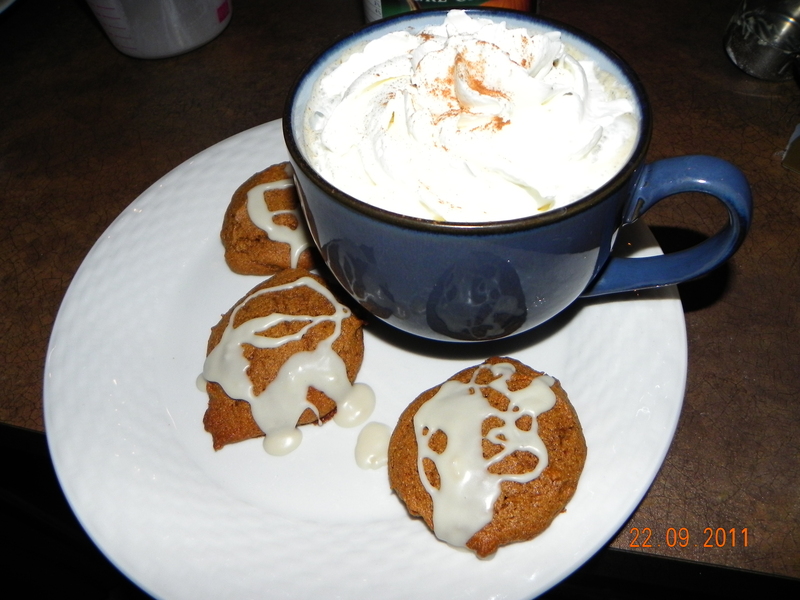 Enjoy with a couple frosted pumpkin cookies. ETA: The remaining pumpkin pulp tastes great as a spread on pancakes.